Replica Viking Sword: This short but strong sword raided the English coast during the 9th and10th Centuries. 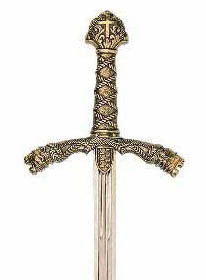 It features a lobed pommel with a curved hand guard. Blade measures 30.5”. Features: Overall length: 36.5”, Weight: 3.6 lbs.